California was the only state with a measure on recreational pot, but South Dakota and Arizona ballots included medical marijuana initiatives, South Dakota’s Measure 13 went down in flames, 63 percent to 37 percent. Arizona’s Proposition 203 was statistically on the fence, though no-votes were ahead by about 7,000 with 92 percent of precincts reporting early Wednesday morning. 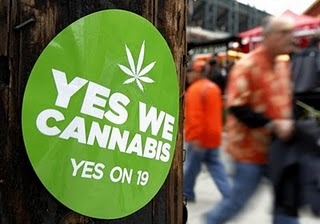 There are currently 14 states, and the District of Columbia, with forms of medical marijuana laws. The proposal – titled the “Regulate, Control and Tax Cannabis Act” – would have allowed adults 21 and over to possess up to an ounce of pot, consume it in nonpublic places as long as no children were present and grow it in small private plots. Proposition 19 also would have authorized local governments to permit commercial pot cultivation, as well as the sale and use of marijuana at licensed establishments. Supporters of Proposition 19 blamed Tuesday’s outcome on the conservative leanings of older voters who participate in midterm elections. They also acknowledged that young voters had not turned out in sufficient numbers to secure victory, but said they were ready to try again in two years. According to preliminary exit poll data, only about 1 voter in 10 said that his or her main motivation to vote in this election was Prop. 19. Voters younger than 40 were slightly more drawn by the marijuana contest than older voters, but even among the younger voters, Prop. 19 came in third. “Even if we are cheated out of a win today, we have changed the debate from licentious hippies-versus-straight-arrow cops to one that recognizes this issue in all of its complexity,” Russo said, according to the Los Angeles Times. Oakland’s City Council late Tuesday adopted regulations permitting industrial-scale marijuana farms, a plan that some small farmers argued would squeeze them out of the industry they helped to build. California’s Proposition 19, the marijuana legalization initiative that will appear on November’s ballot, got a big boost Wednesday as it won the endorsement of the council which oversees the political work of the United Food and Commercial Workers Union in the state. “I’m expecting to garner the endorsements of most of the major unions in California over the next several weeks,” said Dan Rush, who oversees special operations for the UFCW, Local 5, and has pushed efforts to gain union support for the measure, reports John Hoeffel of the Los Angeles Times. Local 5 has assigned Rush to work on the initiative. “I’ll be handling the strategy to bring in other unions, and their endorsements and resources,” Rush said. The local has around 26,000 members in California and has already started a drive to organize workers in the expanding marijuana industry, with about 100 of the pot workers already having joined as members. Local 5, along with the union’s Western States Council, which coordinates political activities with union locals in California and four other states, endorsed Prop 19. The endorsement was a natural outgrowth of the Council’s support for the medical marijuana initiative in 1996, according to Executive Director George Landers. “We view Proposition 19 as an enhanced version of the previous proposition that creates taxable revenue, and produces jobs in agriculture, healthcare, retail and possibly textile,” Landers said. The state’s unions could play a pivotal role in the Prop 19 campaign, if they commit substantial money and hours to the effort. Besides contributing cash, union workers often operate phone banks and campaign door-to-door for endorsed initiatives. The support from unions also helps to drive home another central message of Prop 19 proponents, according to Hoeffel: That marijuana should be treated as a business that could create jobs and bring in much-needed tax dollars.